Guidelines released before snowstorm predicted for next week; municipality takes precautions, building on lessons from 2013 snowstorm. 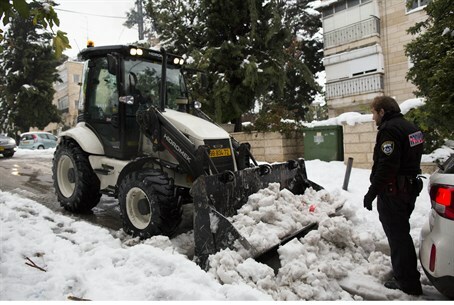 The Jerusalem municipality and the security agencies have called on the inhabitants of Jerusalem to prepare in advance next week, ahead of temperatures approaching freezing and possibly bringing snow with it, according to a bulletin released Saturday. Municipal emergency staff have completed preparations for stormy weather and recommends residents stay safe, prepare for stormy weather and follow guidelines released in the event show does fall next week. The municipality recommends that all residents check that their heating systems work, especially those that require ventilation, and equip themselves with heating systems not based on electricity. Last year's snowstorm knocked down power lines in Jerusalem, Judea, and the Binyamin region - among other areas - leaving millions of Israelis without power, and often without heat, for days at a time. The municipality also recommended that residents clean gutters, trim trees and branches close to power cables and hanging over roofs, do maintenance on water heaters, remove objects from rooftops and balconies, and stock up on backup batteries for mobile phones. In addition, residents have been recommended to stock up on food and water in the event of a blizzard. The municipality will operate a special page on its website on which residents can receive up-to date-information on emergency procedures and information from the various authorities, including security agencies, emergency services (e.g. police, fire department, etc. ), the Israel Electric Company, and the Water Authority. Pruning crews have already begun trimming trees on municipal property and in parks, it noted, following lessons learned from the last snowstorm, in December 2013. The Jerusalem Education Administration has stated that it is in the process of evaluating if, and when, to cancel school in the event stormy weather becomes more likely, and that it will speak to the media as soon as the decision is made in the event a storm front moves toward the capital. Homeless shelters and clinics for the elderly will also be opened at all hours in the event of a storm, it said. Gihon firefighting and rescue services are currently in training exercises to practice emergency rescue procedures in the event of flooding, as well - following numerous incidents this year and last due to unusually high rainfall levels. The city has also asked local residents to check whether their neighbors need help or assistance. The municipality recommends that residents and visitors that avoid traveling on the roads during a snowstorm unless absolutely necessary, and to refrain from staying under sheds, pergolas, or temporary structures in the event Israel sees more than 10cm (3.93 inches) of snowfall (out of concerns for a collapse).